Dog's are often referred to as "man's best friend," but sometimes that friend isn't welcome. Whether it be your own dog, a neighbor's pet or simply a local stray, keeping a dog off your porch can decrease the likelihood that the dog will startle or even harm visitors -- and it can help keep the porch area clean. 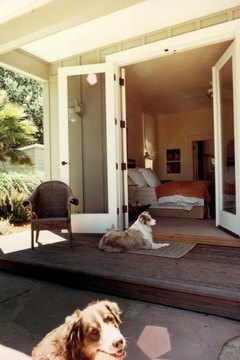 Here are a few ways you can deter a dog from entering the porch-area of your home. Enroll in dog training classes, if the dog in question is your own. One of the more popular commands taught in many training programs is the "Leave it" command, which can be used to deter your dog from stepping onto your porch; and deter numerous other activities or behaviors. Taught using the positive reinforcement method, in which a treat of some sort is presented to the dog along with verbal praise every time you enforce the command "Leave it" and the dog responds appropriately. Teaching a dog to stay off the porch through verbal commands can help decrease the chances that it will run out of the home and into oncoming traffic. Contact the owner of the dog, if you know who it is -- such as a neighbor -- and ask them to stop their dog from coming onto your porch. Unfortunately, irresponsible dog owners may not respond to such a request, and you may need to contact your local department of animal control to alert them to the problem. If possible, take pictures of the dog on your porch and write down every incident to demonstrate frequency. According to the American Society for the Prevention of Cruelty to Animals, most law enforcement agents will issue a summons to a pet owner in violation of the law. Purchase items that can deter stray dogs from entering the porch. For example, look for motion-activated ultrasonic animal repellent devices that can be anchored into the ground in front of the porch area. The battery-operated device will emit a high frequency sound that is not audible to the human ear, but that is very unpleasant to canines. You can also invest in a hand-held liquid repellent that can be squirted at any dog as it approaches the porch. None of these products cause harm to animals or humans.